Avery Return Address Labels 800 pcs - White 0.50" Width x 1.75"
Return address labels are designed for use with laser and inkjet printers. Compatible with the Avery Quick Peel Automatic Label Peeler (sold separately) so you can peel and apply labels up to two times faster than by hand. 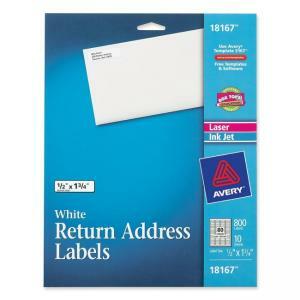 Customize your labels with free Avery templates that work in more than 100 popular software programs.